While most of the attention has been placed on the success of this years ospreys at Bassenthwaite Lake in the English Lake District, amazing news comes from a former youngster called White 14. This is a chick which hatched at Bassenthwaite in 2013 and was fitted with a satellite tracker. He had a rather more easterly migration route than the great majority of all other UK ospreys, and ended up in the Ivory Coast. White 14 then migrated to Bioko, an island off the mainland of Equatorial Guinea, where he stayed for 18 months. White 14 has taken the record for the furthest south any osprey has been tracked covering 8000 km. In his time in Africa and he visited 13 countries. White 14 started travelling north again on 23rd February 2015 and again travelled east crossing the Mediterranean into Italy then moving into Slovenia, Austria and the Czech Republic. Germany was next and Denmark and then travelling back to Germany by 19th May, and then down to to the Rhine, to the East of Dusseldorf by the 22nd May. By the 29th May white 14 was in Sweden and by 19th June he was in Norway having chalked up nearly 30 countries ! Since then he turned south back into Germany and had travelled to Kent by 1st July, and up through the UK to roost in Cumbria by 7th July. 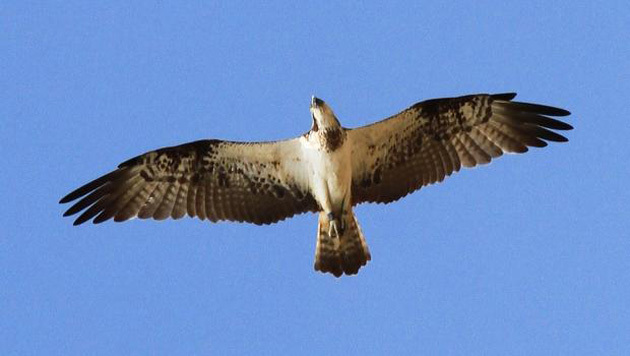 To quote Roy Denis, Internationally renowned osprey expert he said two words….’simply amazing’. Yes this was an truly amazing migration all made possible by the state of the art satellite trackers now being used throughout the world to monitor the migration movements of many species of birds. Let no one forget, last year the two satellite tagged Hen Harrier ‘Skye’ and ‘Hope’ from the Forest of Bowland were successfully tracked just 3 miles from their natal territories before disappearing from the face of the earth. The osprey White 14 was successfully tracked across 13 countries covering 8000 km coming out the other side alive and fit. Lets be clear, both ‘Skye’ and ‘Hope’ were not killed by Peregrines and then eaten, they did not meet their untimely end by any natural cause, they were not spirited away by visiting aliens, they were shot on two red grouse moors in the Forest of Bowland just 3 miles from where they fledged, and their satellite tags destroyed. 4 comments to An amazing English Osprey Migration Record. And the Government doesnt to give a **** disgusting. A truly amazing journey. What a traveller. The use of these trackers is really opening up new information and whilst I would not wish to see too much use in can only be a good thing in general terms. I appeal to my MP to act for wildlife not against it. They deserve so much better than what they get. Wonderful migration by White 14 not good by 2 Hen Harriers. It is quite incredible what data satellite tracking devices can provide. Excellent success story with these Ospreys.